The question that I tend to be asked the most is, "Are you going to ride?" And any variation there of. This is not one of my favorite queries because not only do I feel like it's putting pressure on me but it down right irritates me. Seriously, don't people realize that you can do more with a horse than ride it? Really who cares if I ride or not? That's between my horse and I. Plus there are so many other things that you can do together. Personally, I think that giving your horse a break from being ridden and then doing something else that you both can have fun with is good for the emotional and mental state of the horse. One reason that I feel so strongly about not wanting to be asked this question all of the time (seriously I got asked more than a handful last week) is that I started out not being able to go riding anytime that I wanted. 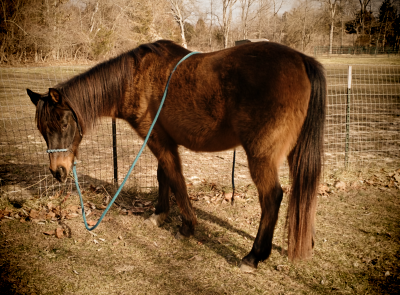 My mother's mare, Sheeba, was not a beginner's mount. Thus, for safety reasons I was only able to ride when my mom was there to teach me. However, the one thing that I was allowed to do on my own was groom her. Since I am horse crazy and have been ever since I can remember, guess what I did a lot of to be able to be around the horse alone? Lots and lots and lots of grooming. Then cue Cocoa, he came home in the middle of December and since we had no indoor arena or other place to ride in the winter I did a lot of grooming. As you can see, I got a different kind of start with horses and thus riding, while fun, is not my biggest priority. Especially with a new horse. So, what are some things besides groom that you can do with a horse? Take time to just hangout or sit with your horse in the pasture (arena can work too). You can even take a book to read or coloring book to color in with you so you're just sharing time and space together. Karen Rohlf of Dressage Naturally says that none demanding time with your horse can help strengthen your partnership. I am actually doing this with Gemma as a training program called The Chair Challenge. I have actually talked about this a little bit previously in my post Goals for April. Really all I am doing is taking a chair into her area and sitting in it without interacting with her. So far she has shown little interest in me but I am going to keep at it because it's actually helping me be better about living in the moment just like a horse does. You can also take your horse for a walk down the road, around the farm, or in the neighborhood. This helps build partnership through spending time together. It is also great for working on ground manners since you are leading your horse and it will in turn will help you both build communication. When I went through a period where I was afraid to ride Cocoa, I took to taking him for walks. Even once I felt confident to ride him again I continued doing this because I found that we both actually enjoyed it. And because I was being consistent on asking him to behave, his manners improved drastically too. I am doing this with Gemma too because she could use some work on ground manners and it's also a way that we can go spend time together . Gemma wanted to follow me after lunging. There are always things to teach your horse on the ground. Many of them help you earn respect and partnership points. Ground work can consist of working on the horse being polite about going through gates, round penning, doing patterns on the ground, etc. With Cocoa I did a lot of lunging, round penning, and making sure he minded his p's and q's. I am continuing to do the same with Gemma. I use ground work as a way to gain confidence with a horse, earn respect, and it's a good way for you to get to know each other as well. Cocoa stretching for a carrot chunk. Teaching your horse tricks can be something fun to do for the both of you. You get to help your horse learn something new and they get food rewards for doing it. That's my simple take on it anyway. I haven't done much of this kind of training at all. The one things Cocoa did know how to do was stretch for his carrots. He had to stretch his head down between his front legs and then around to each of his sides for the carrot chunk. I really wish I would've looked into more tricks for him since I think he would've found it fun. I am planning on doing more than just stretching with Gemma. She picked up the stretching part really quickly and food is a high motivator for her. She is also intelligent and I hope it will bring out more curiosity. Do yourself and your horse a favor by doing more than just one thing, do a variety. Not only will it make your horse happier but it will help your partnership as well. Cocoa and I ended up with an awesome bond through doing different things because it kept him from getting bored. Remember that it's not an I, it's a we. If you are looking for more ideas check out this post by Horse Tricks 101: 31 Things To Do With Your Horse (other than riding).